We present a simple approach to rapidly identify amino acid types in proteins from a 2D spectrum. The method is based on the fact that 13C? chemical shifts of different amino acid types fall in distinct spectral regions. 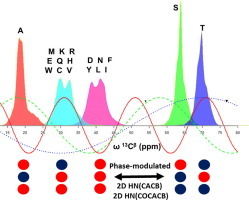 By evolving the 13C chemical shifts in the conventional HNCACB or HN(CO)CACB type experiment for a single specified delay period, the phase of the cross peaks of different amino acid residues are modulated depending on their 13C? shift values. Following this specified evolution period, the 2D HN projections of these experiments are acquired. The 13C evolution period can be chosen such that all residues belonging to a given set of amino acid types have the same phase pattern (positive or negative) facilitating their identification. This approach does not require the preparation of any additional samples, involves the analysis of 2D [15N-1H] HSQC-type spectra obtained from the routinely used triple resonance experiments with minor modifications, and is applicable to deuterated proteins. The method will be useful for quick assignment of signals that shift during ligand binding or in combination with selective labeling/unlabeling approaches for identification of amino acid types to aid the sequential assignment process.